Itron is linking its smart meters to home energy management devices from startup OpenPeak, which has links to the telecommunications industry. Smart meter giant Itron has chosen OpenPeak – a home energy management device maker with links to the telecommunications industry – as a partner to carry Itron smart meter data into homes. The partnership could be a harbinger of a new level of integration between two separate routes into the home energy management space – utility-owned smart meters, and the telecom and cable worlds. Not that the two companies have announced any projects featuring the newly linked technologies yet. Monday's announcement simply says that Itron has given OpenPeak the technology to read the signals coming off of Itron's one-way and two-way communicating smart meters, as a way to bring that energy usage data to the attention of homeowners. That's one way of getting data from the about 67 million one-way communicating gas, water and electric meters out Itron has out in the field into homes, and from there back to utilities via communications like broadband internet, which is exactly what Itron has asked home energy management startup Tendril to do as well, though only with its one-way communicating electric meters (see Tendril Moves to Link Up Old-School Meters). 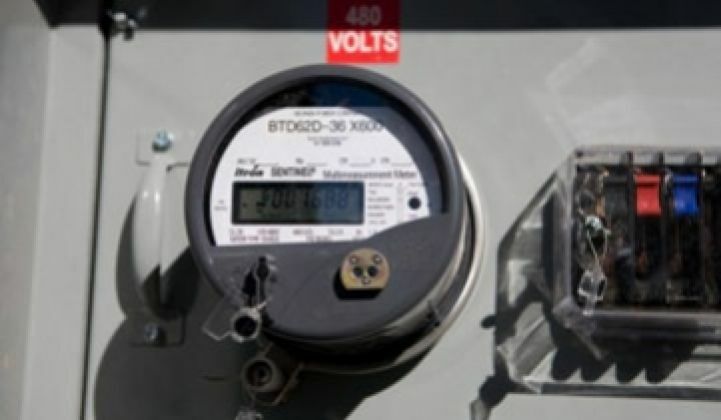 Itron will also open up to OpenPeak data from its two-way communicating meters, of which there are about 14 million now set to be deployed under existing contracts, said Linda Warner, product manager with Itron. Such gateways from smart meter to home energy display and control systems are part of most utilities' smart meter plans, since they can let customers watch and manage energy use to save on peak power demands and generally improve efficiency (see The Smart Home, Part I). Itron has a similar partnership with demand response provider and home energy device maker Comverge (see The Elusive Smart Meter-Demand Response Combo). But OpenPeak has something those other partners don't have, or at least haven't publicly announced – some tight links with telecom companies that are seeking to provide their own energy management systems for homes. Specifically, OpenPeak sells its touch screen and voice-over internet protocol (VOIP) devices through telecoms including Verizon in the United States and Telefonica subsidiary O2 in the United Kingdom, though it hasn't said whether energy management is part of what's on offer from the two companies (see The Telco Home Energy Invasion). Adding energy management to the applications available- and giving them the ability to communicate via WiFi and ZigBee wireless protocols, as well as with cellular networks or over broadband connections - makes those touch screens and portable devices a bit like iPhones that also do energy management, says CEO Dan Gittleman. "We're under $200, and we have platforms coming out that will be substantially cheaper than that," said Gittleman, who has grown the company with $90 million in private investment and the money he made by selling his previous company, StorageApps, to Hewlett Packard in 2001. Verizon, AT&T, BT Group (formerly British Telecom) and Bell Canada are among the telecoms looking to add energy management to their list of in-home services (see Verizon to Add Energy Management to FiOS). Itron's Warner made it clear Monday that the company has no immediate plans to work with telecoms on home energy management. However, "I think there's just a tremendous opportunity here for utilities and their local telecom companies to work together," she said. As for Gittleman, he said OpenPeak would soon announce some "very large deployments" of energy management-capable in-home devices with telecom companies involved. He also said he expected some pilot projects involving OpenPeak and Itron to be announced in the next few months, though he wouldn't provide more details.